Would you like to see how a local search marketing campaign works from start to finish? Join me as I chronicle my step by step experience creating a campaign for a brand new business in Southwest Florida. The business is Ft. Myers Motorcycle Rental in Ft. Myers Florida. The business owner, Tom Kindelan, knows the value of local search first hand (read his testimonial) so he asked me to get started on a local search project for a new business he wanted to start. Here’s what we did. Tom decided he wanted to start a motorcycle rental business and open it before the snowbirds came to visit Southwest Florida in the fall. He called me and asked what he needed to do over the summer to prepare for the work we would do in early fall when we started his local search marketing project in earnest. This was my advice. Get a local telephone number exclusively for your business. You won’t need it until about 60 days before you open, but Google suggests/demands/requires that you have a unique telephone number for each business. 239-257-8085. Research your competitors on Google and determine your niche. What will make Ft. Myers Motorcycle Rental different, better? Rent a pre-owned, professionally maintained Harley-Davidson motorcycles for a fraction of the cost you would pay to rent a new Harley. Purchase motorcycles to rent before you start getting calls. Now it’s my turn. I took the information Tom had researched and built a fully optimized website for his local business http://www.ftmyersmotorcyclerental.com. (Optimizing a website for local search marketing is very different from standard website optimization.) I also optimized and claimed his business listings on Google, Yahoo! and Bing. Unfortunately, because Tom owns another business at the same location, neither Google nor Bing allowed me to claim his business via the telephone. We had to wait to verify Ft. Myers Motorcycle Rental through the mail. No big deal! My next step was to place his business listing on UBL and Localeze in order to promote his business on the Internet and acquire tons of citations, which I did over the next few days. Then I ran off a list of the most powerful citation websites for motorcycle rental companies in Southwest Florida using a very, very cool tool from Whitespark. I gave this list with Tom to share with his staff so they could gather even more citations over the course of the next few months. This is something he and his staff did without my assistance. It’s easy to do when you know how to do it. As of October 8, Ft. Myers Motorcycle Rental is not showing up on any of the search engines for Tom’s primary keywords which are “Ft. Myers Motorcycle Rental” and Ft. Myers Harley Rental.” He won’t be renting motorcycles until mid-November, so we will not be able to acquire reviews until that time, but rest assured, he will be generating 5-star review from his happy customer. Tom is very good getting reviews. Return on Investment: My guess is that once Tom opens for business, he will recoup his investment in less than 60 day … and that’s without any ongoing monthly fees. Sweet! Stay tuned and let’s see how well this local search marketing project works for Tom, both in search engine placement on the Internet and more importantly, in real dollars for a start-up business. Just received a call from Tom, the owner of Ft. Myers Motorcycle Rental. His business listing is now in the second spot for the term Fort Myers Motorcycle Rental and he’s in the third spot for Fort Myers Harley Rental on Google. Now his quest is to continue gathering business citations from the list provided by Whitespark and generate 5-star customer reviews using the 5-Star Review System … which he will do as soon as he starts renting bikes. I change the description text to now read, “Save 30 percent by renting your Harley-Davidson Motorcycles from Ft. Myers Motorcycle Rental in Ft. Myers, Florida.” The goal is to attract Harley renters who want to save money on their rental. I’ll be keeping an eye on this to see how quickly Google picks it up and if it makes a difference in the number of rentals. Pictures speak louder than words. Take a look at the graphic below and see how Fort Myers Motorcycle Rental is doing the the major search engines. 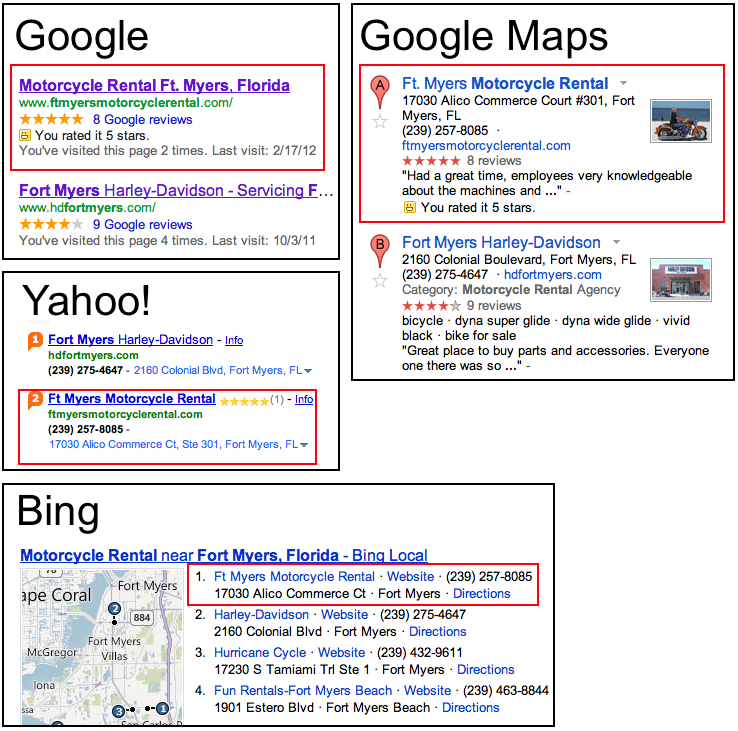 As of a few weeks ago, Fort Myers Motorcycle Rental took the first place spot in Google. Tom’s business listing is just ahead of the Harley listing with eight reviews and a 5 -STAR rating while the Harley Dealership has nine reviews with a 4-STAR average rating. Just a few months ago, this business did not exist. Today, Google is presenting Ft. Myers Motorcycle Rental as the best, most trusted Motorcycle Rental company in Ft. Myers Florida … even more trusted than the Harley-Davidson Dealership that has been in business in Ft. Myers for years. Fort Myers Motorcycle Rental is listed in the first spot on Google Maps too, ahead of the Harley Dealership. It also has a higher customer rating with a more compelling photo and a better review for someone interested in renting a motorcycle. Studies show that 20% of people doing local search use Google Maps rather than Google. That is why it’s so important to be listed high in the search results here too. Fort Myers Motorcycle Rental is listed in the second spot on Yahoo, which a lot of business owners tend to discredit. On average, Yahoo generates about 1/4 the number of calls you can expect from Google, depending on the industry you serve. It’s important to be listed high on Yahoo! too. It only takes one customer review for the stars to show up on yahoo! It takes 5 reviews before stars show up on Google. Focus on getting at least one 5-star review on Yahoo! Ft. Myers Motorcycle Rental is in the #1 spot on Bing … ahead of the Harley Dealership. Bing also represents about 1/4 the traffic of Google, and Bing is growing in importance every day. Oh, and Ft. Myers Motorcycle Rental is in the second spot for Motorcycle Rental Fort Myers on YellowPages.com with a 5-STAR average rating there too … and Tom’s not paying a dime to advertise there either. Sweet! As you may know from reading my other articles, first page placement on Google, Yahoo! and Bing means nothing if your business listing is not generating new business. According to Tom, he went from zero calls a day before we started his local search marketing campaign to an average of 1 call a day (7 calls a week, 30 calls a month or 365 calls a year) just a few month after we started. That may not sound like a lot, but in the motorcycle rental business it’s the difference between owning a profitable business and going out of business. Initially, I thought it was going to take Tom about 60 days to earn his investment back from the work I did for him on his local search marketing project. As it turned out, it only took 30 days. And, here’s the best part, Tom will see a return on his investment every 30 days without having to pay a dime in advertising … ever. From a local search marketing perspective, things could not have gone better. As Tom and his staff accumulate more and more 5-star reviews and a list of happy customers, he will see a never ending flow of new customers. The success of Ft. Myers Motorcycle Rental is based on four things. A website optimized for local search. Ability to generate 5-star reviews on multiple review websites. Would you like to do the same for your business? You can. Here’s what you need to do. 2. If you want to do Local Search Marketing yourself, invest in the DIY Local Search Marketing System. You can learn more about it here. 4. Don’t have the time or inclination to do it yourself? Give us a call at 808-891-0449 and talk to us about your project. We can get you moving in the right direction.